Even esteemed Vietnamese art institutions, including major national museums, have showcased paintings they acknowledged were not authentic. 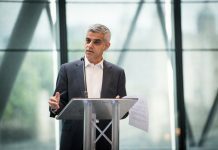 Likewise, the auction houses Christie’s and Sotheby’s, as well as a consultant who worked for both of them, have sold works later dismissed by some experts as fakes. Some of Vietnam’s greatest artists are enjoying a moment of increasing world attention, especially those who studied at the French-influenced Fine Arts College of Indochina before World War II. The best of them synthesize European post-Impressionist trends with classical Asian styles and subjects, and their work is commanding higher prices. Vietnamese art remains a niche market globally but is surging in popularity at international auctions. In April, a late 1930s painting by one artist, Le Pho, sold for nearly $1.2 million at a Sotheby’s auction in Hong Kong, breaking the $844,000 record set by another of his paintings in 2014. But artists and dealers complain that the proliferation of fakes is dragging down the value of Vietnamese art. 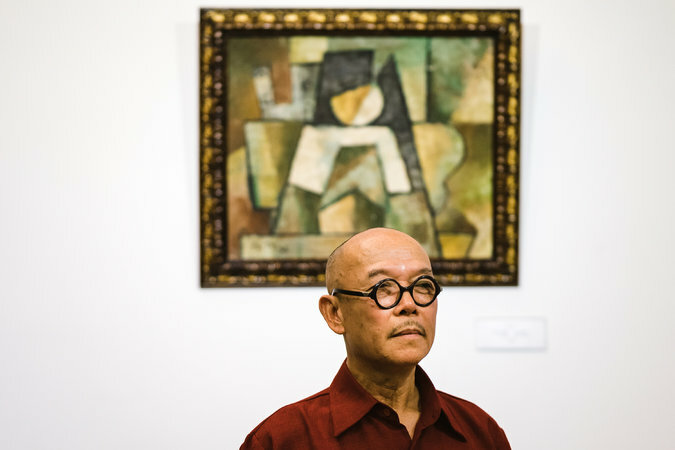 The artist Nguyen Thanh Chuong, with a painting identified in a museum as the work of one of Vietnam’s best-known artists, Ta Ty, from 1952. Mr. Chuong, however, says he painted it in the 1970s. Vietnam’s nouveau riche, who have begun to pay high prices for local artists, are a prime target for unscrupulous traders. So are international buyers, whose faith that they are buying the genuine article is bolstered by the institutions that vouch for it. The Fine Arts Museum in Ho Chi Minh City, where the disputed painting by Ta Ty, who died in 2004, was part of the exhibition “Paintings Returned From Europe,” rents its walls to private collectors, giving their paintings the imprimatur of the top museum in Vietnam’s largest city. The 17 paintings in the exhibition belonged to Vu Xuan Chung, a Vietnamese art dealer who said he paid the museum about $1,300 to hold the 12-day event last year. “A museum is the ultimate venue to validate a work of art,” said Colette Loll, founder and director of Art Fraud Insights, a Washington consulting firm. After questions surfaced about the paintings, the museum quickly determined that none of the 17 paintings were created by the painters claimed by the exhibition. Museum officials apologized to the public and said they would hold the paintings for an investigation. But that never happened. Soon after, the museum quietly returned the paintings to their owner, Mr. Chung, who disputes the museum’s findings and says the paintings are authentic. He is now offering them for sale and recently sold one for more than $66,000. All 17 paintings had been certified as genuine by a French art expert, Jean-François Hubert, a senior consultant for Vietnamese art at Christie’s. One painting still had a Christie’s tag dangling from it. Mr. Hubert appears to have had a conflict of interest. The 17 paintings had belonged to him, and he had sold them to Mr. Chung, his friend of more than 20 years, Mr. Chung said. Christie’s said it would not knowingly auction any works if it had valid concerns about their authenticity. A spokesman for Christie’s said that the company had nothing to do with the show in Ho Chi Minh City and that Mr. Hubert was acting on his own. Vu Xuan Chung, the owner of the disputed paintings, at the exhibit in Ho Chi Minh City last year. He said he bought them from a consultant for Christie’s auction house, who authenticated them. Mr. Chung insists the paintings are original and is still selling them. Christie’s and Mr. Hubert were recently tied to another incident where Vietnamese art experts challenged the legitimacy of a painting the auction house sold in May. In the auction catalog essay by Mr. Hubert, Christie’s said the painting, “Dream of the Following Day,” was a “touching and inspiring” work by one of the country’s most prized artists, To Ngoc Van, circa 1940. A newly discovered painting by Mr. Van would indeed be valuable. Regarded as a revolutionary hero and one of Vietnam’s greatest painters, he died in 1954 from injuries he suffered at the Battle of Dien Bien Phu. In 1996, he was posthumously awarded the Ho Chi Minh Prize, one of the country’s highest honors. Christie’s sold the painting to an unidentified buyer for about $45,000. But Vietnamese art experts said the painting was actually an uninspired copy of “The Young Beggar,” by the Spanish artist Bartolomé Esteban Murillo. Painted in 1650, it hangs in the Louvre in Paris. Christie’s said it had completed “rigorous due diligence” and had “no basis” to question the painting’s authenticity. Even at the country’s most prestigious museum, the Museum of Fine Arts in Hanoi, officials have long been uncertain which of their treasured paintings are copies and which are genuine. During the war with America in the late 1960s, museum officials removed hundreds of artworks for safekeeping, in case Hanoi was bombed by the United States, and commissioned copies to replace them. Originals disappeared, copies were passed off as originals, and no one knew which was which. Asked whether the museum had since tried to sort them out, the director, Nguyen Anh Minh, only smiled. Adding to the confusion, relatives of some prominent artists were known to certify copies as originals so they could fetch a higher price. At an auction in Hong Kong last year, Christie’s sold the paintings “Boats on the Perfume River” by To Ngoc Van for $57,000, and “A Lady of Hue” by Le Van De for $89,000. Identical paintings are hanging at the Museum of Fine Arts in Hanoi. The museum says it acquired “Boats” in 1965 and “Lady” in 1976. 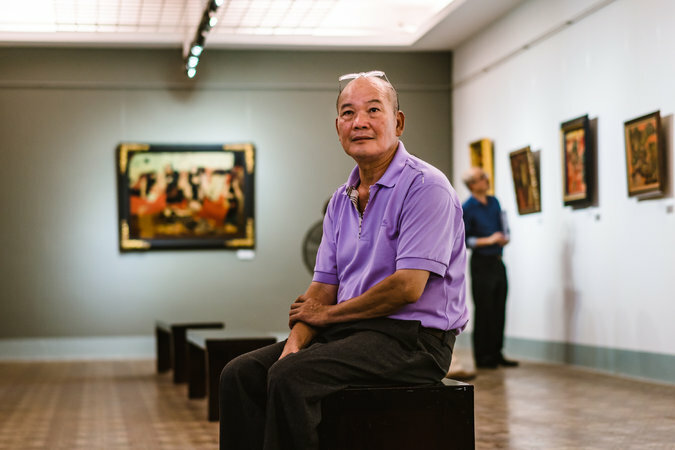 Mr. Thanh, Mr. Van’s son, said that many copies of the two paintings were made decades ago and that it was difficult to know which were the originals. The Christie’s catalog does not mention that fact. The description by Mr. Hubert said “Boats” was painted in 1935 and acquired from a private collection in Germany. “A Lady of Hue” was painted in 1945 and, Mr. Hubert wrote, authenticated by a student of the artist’s. 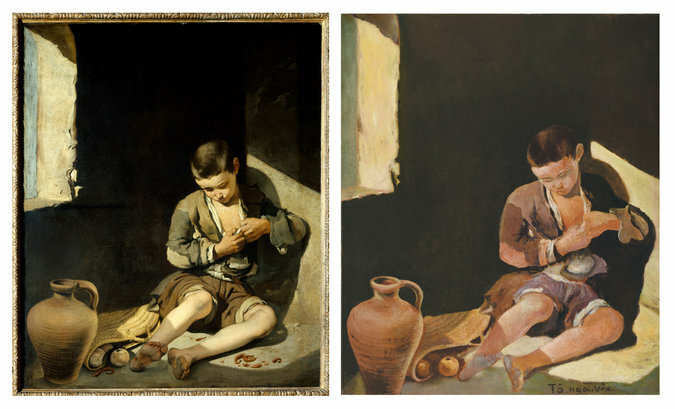 “The Young Beggar” by Bartolomé Murillo, circa 1650, left, and a painting sold by Christie’s in May, as “Dream of the Following Day” by To Ngoc Van, circa 1940. Vietnamese art experts cast doubt on the authenticity of the one sold by Christie’s, calling it a poor copy of the Murillo, which hangs in the Louvre. 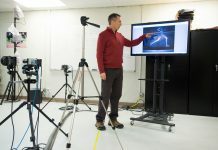 To prove a painting is genuine, experts can analyze its appearance, establish its ownership history, and use scientific tests to examine how it has aged and whether its materials come from the right period. In Vietnam, many paintings lack proper documentation. And there is no lab that analyzes artwork or has a database of the obscure materials and homemade pigments that artists often used during wartime. For the 17 paintings in the “Returned From Europe” exhibition, Mr. Hubert provided notarized letters of authentication, identifying him as a Christie’s consultant. In most cases, he provided little or no information about the paintings’ provenance, including where they were in Europe before their supposed return to Vietnam. The same year, Sotheby’s was accused of trying to sell four other fake Vietnamese paintings, all said to be by Bui Xuan Phai, another graduate of the Indochina school. Sotheby’s denied at the time that any of the paintings were copies. 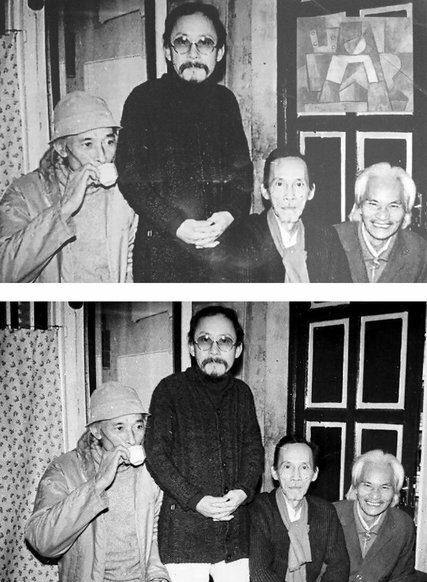 In response to the uproar over the supposed Ta Ty painting in the “Returned From Europe” show, Mr. Hubert distributed a photograph that he said was taken in 1972 showing the painting hanging in a room near four well-known Vietnamese art figures. He said the painting had come from the son of one of them, a filmmaker. Top: A photo distributed by Jean-François Hubert, a consultant for Christie’s, which he said showed a painting by the Vietnamese master Ta Ty hanging on a door near four well-known art figures. He said the painting was acquired from the son of one of them, backing up his authentication of the painting. Below: A photo provided by the family of one of the subjects, which they say is the original, without the painting in question. But it quickly became apparent that the photo had been clumsily altered. Two people posted the original, which does not show the painting, on Facebook. Mr. Hubert did not reply to questions about the photo. It is not known who altered it. Despite concluding that the 17 works were not genuine, the museum had little recourse. It had no means to prove the paintings were fakes or forgeries, one official said, so it had no legal authority to keep them. Even as he continued to insist that all 17 paintings were genuine, Mr. Chung returned the supposed Ta Ty to Mr. Hubert for one he could sell. He is optimistic that he will find buyers for all of them.